Caterpillar Local Host Plants: Trema tomentosa (Ulmaceae, common name: Rough Trema, Poison Peach), Trema cannabina (Ulmaceae, common name: Lesser Trema). A male Courtesan perching on a branch of a Trema plant. 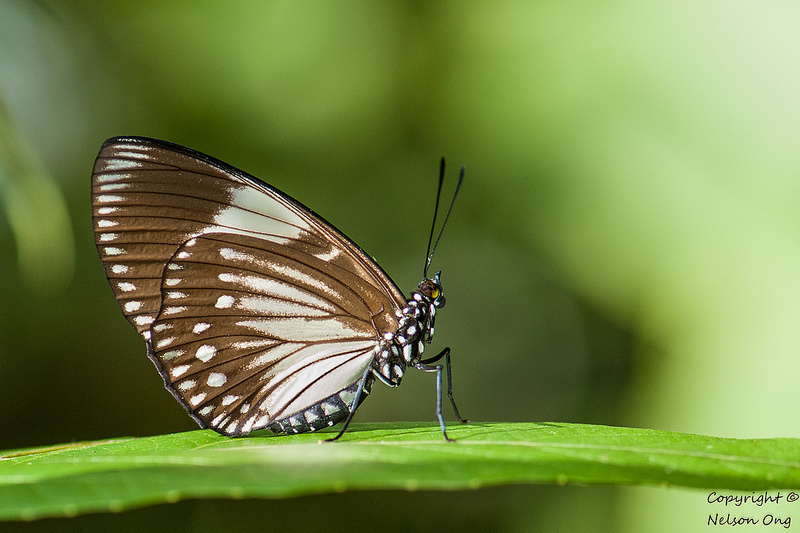 A male Courtesan resting at a leaf perch. 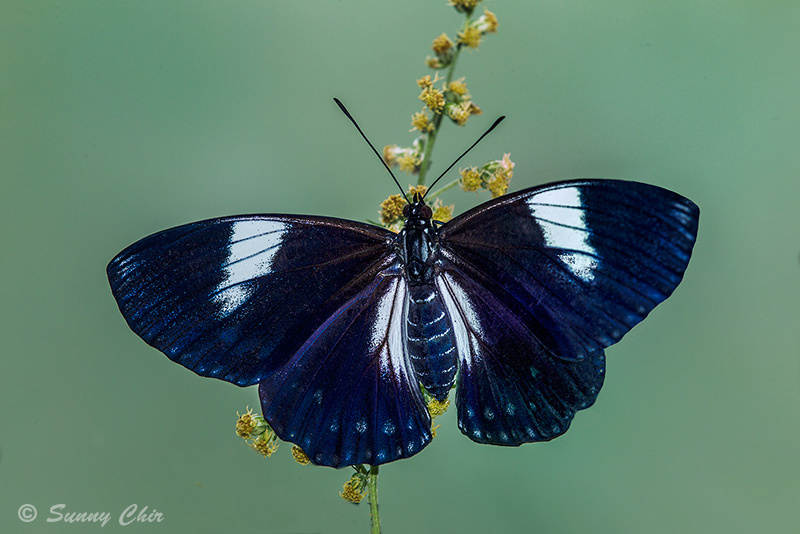 A sunbathing male Courtesan giving a view of its upperside. The eyes of both sexes are yellow but those of the female are darker with varying degrees of brown shading. 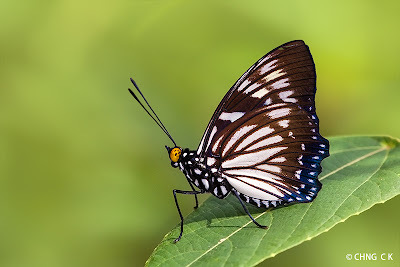 The male has the termen of its hindwing indented between veins 2 and 4, and between veins 5 and 6. 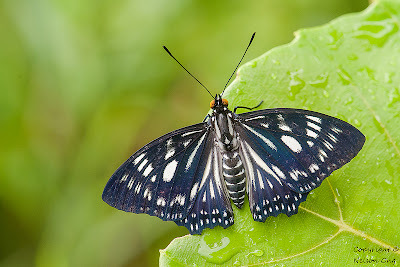 Above, the male is bluish black with its forewing endowed with a complex series of white spots/patches in the cell, discal and post-discal areas. 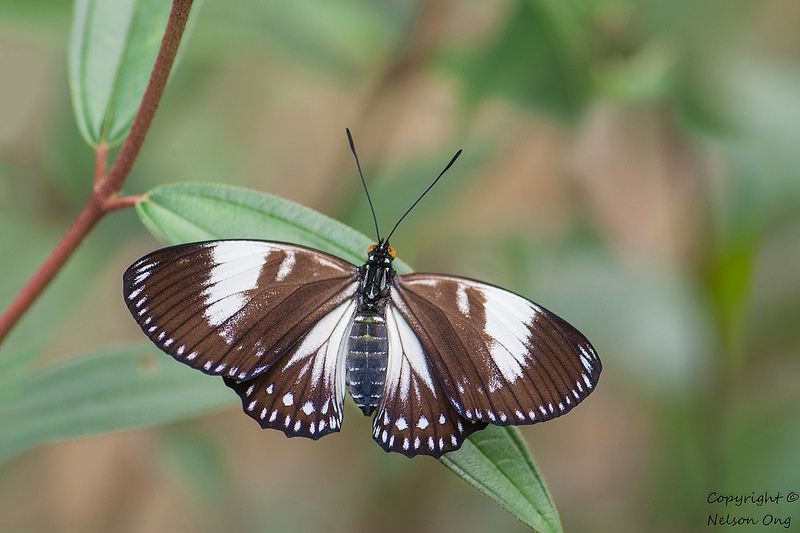 The hindwing is predominantly white with blackened veins, marginal and submarginal series of small white spots. Of the two female forms (-isina, -euploeoides) present in Singapore, form -isina (a mimic of the male Magpie Crow (Euploea radmanthus)) has its wings bluish black with a large post-cellular white patch on the forewing and a broad white area in the inner basal half of the hindwing. Faint marginal series of whitish spots are present in both wings while a post-discal series of faint white spots is present in the hindwing. 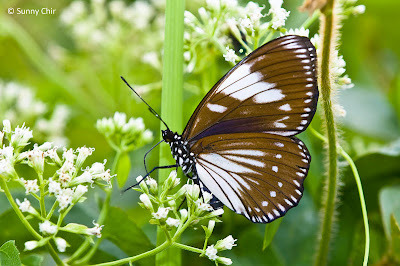 Form -euploeoides (a mimic of the female Magpie Crow) has its wings brown in colour. In the forewing, the post-cellular white patch is rather broad and an additional white patch is present in the cell. In the hindwing, the whitish area occupies almost two-thirds of the wing. The marginal, submarginal and post-discal series of white spots are larger and more distinct than those found in form -isina. 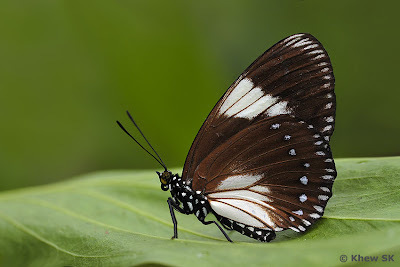 Underneath, the wings are brown for both sexes with similar white markings as per the upperside. 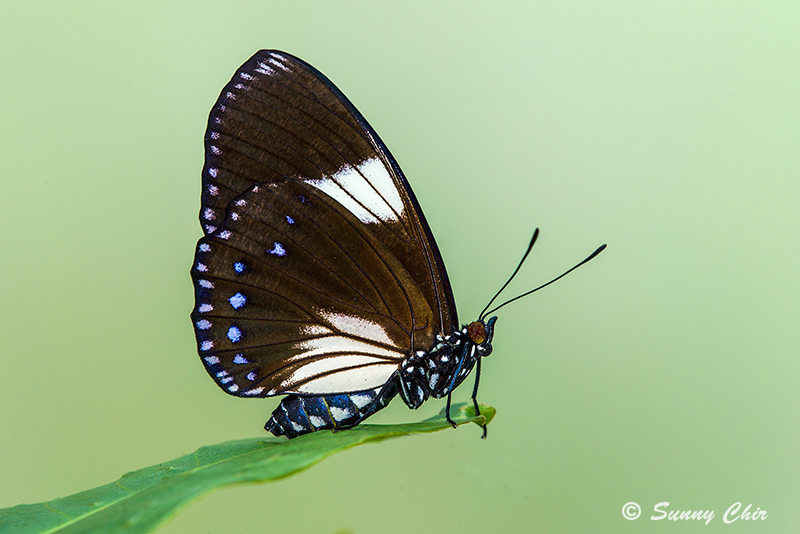 A female form -isina Courtesan on a leaf perch. The upperside view of a female form -isina Courtesan. Another female form -isina Courtesan. Courtesan is rare in Singapore. 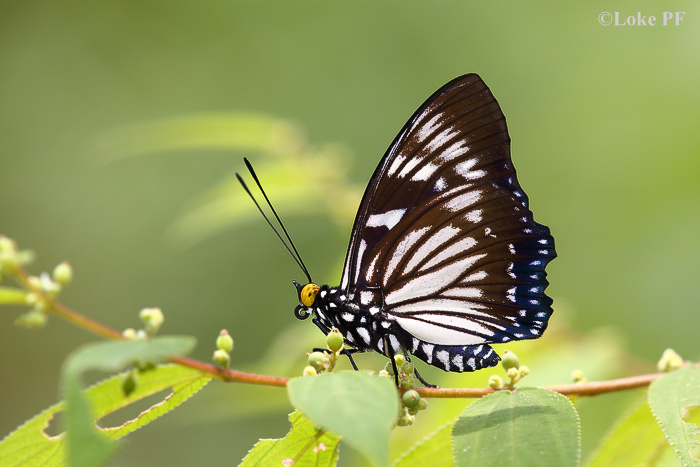 The adults have been found in various parts of nature reserves, as well as Southern Ridges and even the Singapore Botanic Gardens. They are typically found in an area where its host plants are thriving. The male has a strong flap-glide flight pattern while the female mimics the slow and unhurried flight pattern of its model. A female form -euploeoides Courtesan taking nectar from flowers of mile-a-minute. 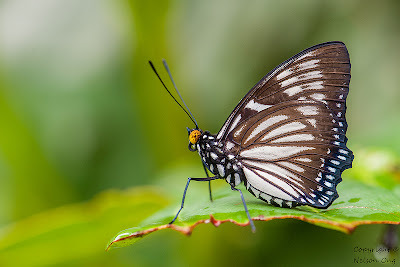 The upperside view of a female form -euploeoides Courtesan. A female form -euploeoides Courtesan on a leaf perch.